In an industry driven by cost reduction, government policy and national chains, our goal is keep the independent pharmacy competitive online, all without cutting corners. The independent pharmacy is at the core of what we do. Our success is intrinsically tied to yours. Your primary focus is offering quality patient care and running your business. Let us handle the web for you. A staggering amount of internet traffic is on a mobile device. We're ready for it and so is your new website. 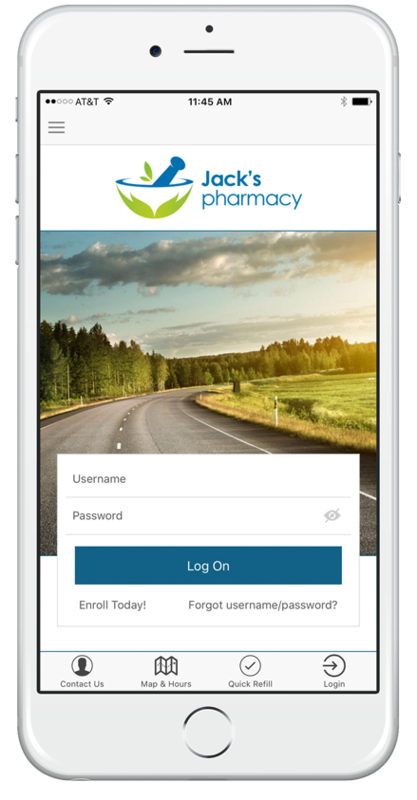 Go completely mobile with your pharmacy-specific custom iPhone & Android Mobile Apps. Whether utilizing the Rx30 integration or the included web forms, receive refill requests directly from your website. We like to get to know your pharmacy and help where we can. We want to be an effective partner, helping promote your business and brand online. Our main priority is to give you the tools to turn website visitors into life long customers. In a competitive industry driven by scrutinized margins, large disruptive chains and mail order pharmacies, it's not only important to have a great website, but a partner that has your success at the core of their business. Your visitors remain your visitors. We don't take them away from your website, ever. If it isn't fully integrated, it's not included. A seamless experience is critical to retain viewers. It's all about you. Our branding is never on your website. We're here to promote you, not us. All changes handled in a timely manner. Keeping your website current is important. Zero website experience needed. You tell us what you want, our job is to figure out how. "A" rated, trusted HIPAA Compliant and HITECH Certified servers for all website traffic. We work directly with independent pharmacy owners, and their teams, to build a digital solution that doesn't just "check the box off the list", but works to further your brand recognition and credibility. In today's instant-gratification digital age, a website and mobile app are as important as a business phone, if not more. Are your hard-earned visitors ever directed away from your website? Are your visitors immediately redirected to a third-party domain? Is your content current and reflecting the services you offer? Are ads being displayed to your visitors without compensation? 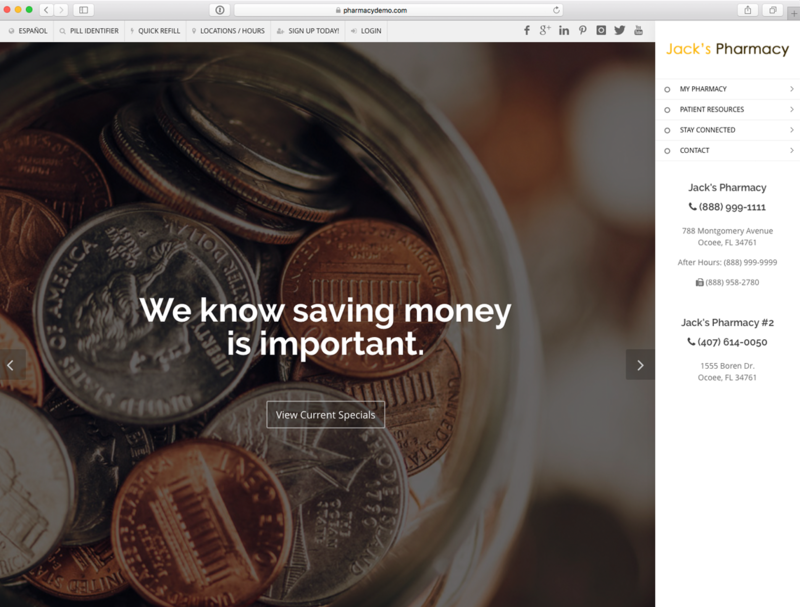 Are you spending screen space promoting a brand other than yours? Does your mobile app reveal local competitors when a patient finds you? Mobile apps are not "the future", they're right now. Think of mobile apps as a billboard, only much more personal. Mobile apps by the numbers. In 2017, consumers downloaded 178.1 billion mobile apps to their connected devices. In 2022, this figure is projected to grow to 258.2 billion app downloads. We have developed a mobile platform that works, in unison with our website offering, to create a seamless mobile app experience. We do more than display your logo, address and hours; we add true functionality that will keep your users coming back regularly. As with every service we offer, our two main goals are always to increase brand awareness and increase patient adherence. Mobile apps are quickly becoming the most important screen real-estate available. Direct Facebook Integration (Recent Status', Photo Gallery, Upcoming Events). Rx30 Integration allowing refilling and review of prescriptions. 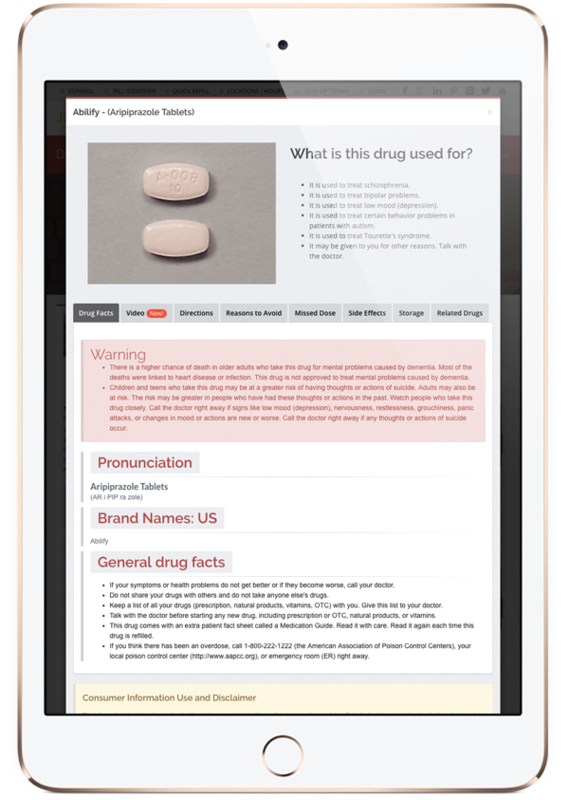 Advanced Features (Recent News & Videos, Meds-On-Cue Videos, Drug Search, Pill Identifer). Available on both the Apple iOS and Google Play stores. Consider our themes your jumping off point. We custom tailor your theme and settings to match your pharmacy's needs, colors and logo. Your website, perfect on every device, everytime. We keep the complicated stuff on our side of the fence. Every theme has pre-built forms tailored to your needs. Finding you on a map is the easy part. Built-in directions too. * Expandable to as many pages as you need. It can grow with you. Need a domain? We can get you all squared away. * Page creation fees may apply. Think of us as your dedicated web department, minus the crazy overhead. Identifying a pill can't get any easier, or more informative. Even see a video if available. It's deceivingly simple. Increase patient adherence through quality resources. 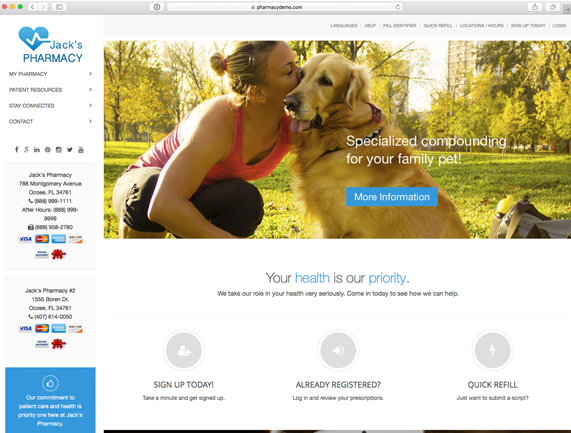 Stop referring your patients away from your website. Facebook is the largest social network in the world, so integration is essential. Share updates, photos and events easily. Largest and most robust medication video library in the world, providing your patients informative videos. Keep your website fresh and informative for your visitors with a live feed of up-to-the-minute health news and videos. We can auto-post curated health news to your Facebook and/or Twitter accounts and drive traffic to your website. We don't believe in contracts. Our quality service should be reason enough to stay. "RefillRx Connect has allowed our independent Good Neighbor Pharmacy the same opportunities as the large chain pharmacies. 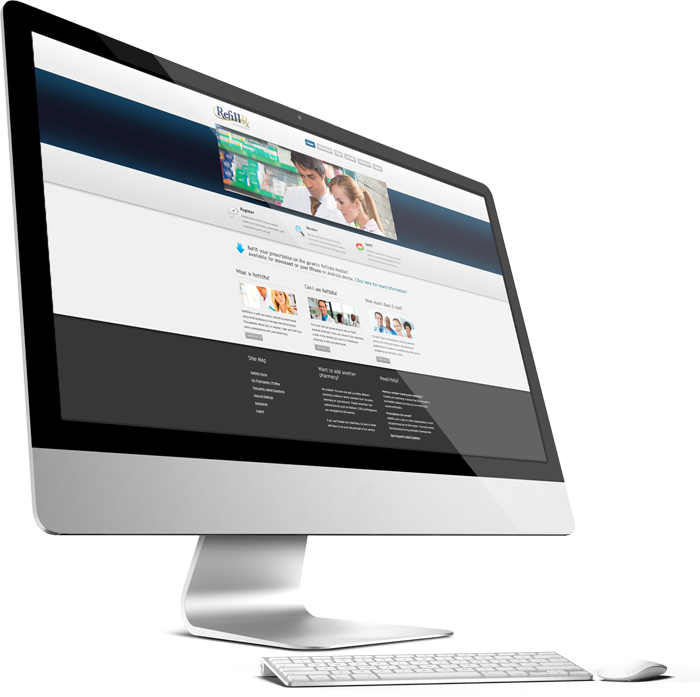 Our website presentation is very professional and facilitates creditable resources for our patients. The online prescription program has been well received by all our patients, including the elderly. The overall experience with RefillRx Connect has been a seamless transition and has improved our efficiency. Thank you." I release my website worries to you. "We've always wanted a website that would allow our customers to shop our products online. RefillRx Connect has now delivered! 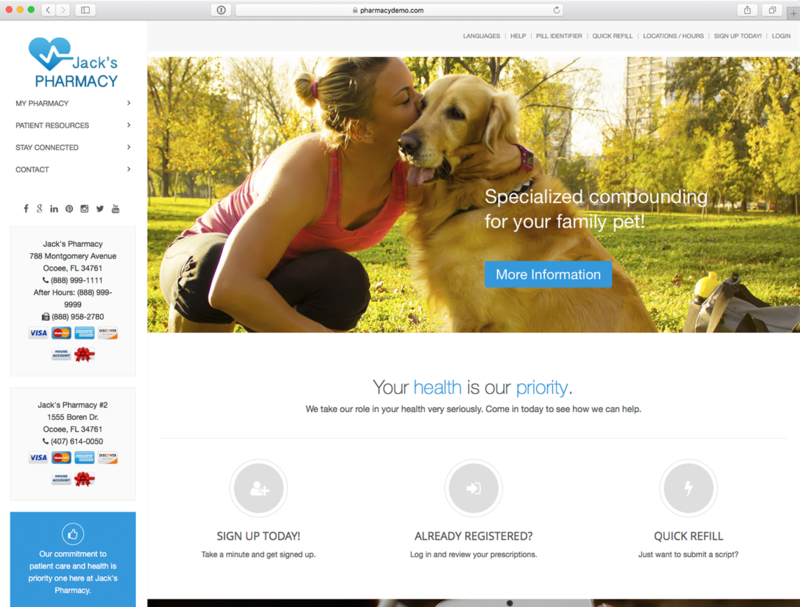 Our Website looks professional and modern and with the new health news, our site now stays current and fresh. Keep up the good work RefillRx Connect." I didn't know it could be this easy! "I had a web page for a few months before finding RefillRx Connect. I was seriously questioning the wisdom of that decision as I was spending more hours for design, updates and edits than I could afford. As a first-time owner of a start-up pharmacy, I was overwhelmed by the many aspects of a new business, much less a pharmacy, but a web presence was essential to the image I wanted to present to my customers. When I got connected with Ian, my whole attitude changed! He responds quickly to questions and produces great results quickly!" From the very beginning of our website, RefillRx Connect has been very courteous, helpful, pleasant and professional. "Always there in guiding us. We made so many changes, even then they were very accommodating. It will be unfair not to mention the services of Melissa. She was excellent. Thank You!" "RefillRx Connect has been extremely helpful in getting our website up and running. Their friendly staff were proficient and helped us to create our first website in a timely manner. We look forward to continuing to work with them." "Setting everything up was very easy and the great people at RefillRx Connect was so helpful during the entire process! Couldn't have been a better experience!" "I decided to expand my growing business by seeking the development of a company website. In today's society it is imperative for a pharmacy to stay competitive with the chain stores. I contacted my pharmacy software company RX30 and asked about any recommendation on website design. I'm glad I made that call. RefillRx Connect is responsible for the creation of my website. They have guided me with their professionalism and expertise every step of the way. Melissa is always enthusiastic, energetic and creative. I have asked them to help me with business cards and store banners recently. I hope we have many more projects we can work on together in the future." Functional and easy-to-use website in just a week! "The team at Stuckey Pharmacy applaud the work done by the designers and creators at RefillRx Connect. Their team listened intently to us during the website planning phase to understand our particular website functional needs and how we envisioned the navigation. From the careful notes they took, they created a perfect design and functionality that went beyond our expectations. Customer service and happiness is clearly a big deal to the RefillRx Connect team. After countless emails and phone calls, they were still asking us if we needed any further help and offered to make additional changes to get the website just right for our customers. Our pharmacists and technicians love the seamless connection to the Rx30 program already in place. The customers have compared our website to their experiences with online banking. They can't wait to check their profile to see what they can have refilled and when they can pick something up. We look forward to a long and happy relationship with RefillRx Connect and highly recommend you check them out for all of your pharmacy website needs." Anyone considering an online platform for their pharmacy should consider RefillRx Connect. 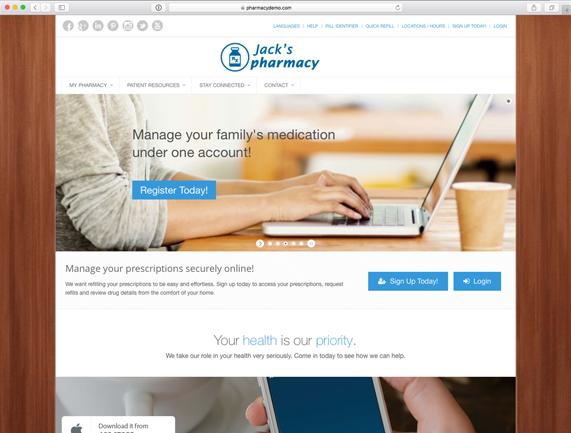 "Since switching, our website looks better, runs smoother and provides customers with improved access to their prescriptions. Melissa has been wonderful to work with and she helped make the transition a smooth one. Competitive pricing, online flexibility and excellent customer service make them an outstanding business choice." "Highly satisfied with the service. Their customer service functions like a small business, valuing each client and spending massive amounts of time with them to get websites corrected and looking good to your liking. This is the best website I've ever made...and I come from a tech background with a previous online company." "With RefillRx Connect, we were able to get a great looking, new website at a fraction of the cost of our previous website provider. Our new website looks like one that normally costs thousands of dollars and it was ready to go in record time! Melissa was a pleasure to work with and was very accommodating to my requests. Another benefit is that the integration with Rx30 is seamless - there was no need to work with multiple vendors to try to get our patients' refill requests to go through. Having spent an entire year trying to get the refill feature on our previous website to work correctly, I can appreciate the peace of mind in knowing that our patients' refill requests will appear in Rx30 when they submit them. I am glad that I made the switch to RefillRx Connect." A great way to promote my pharmacy. "Since I joined RefillRx Connect as a pharmacy, I have been getting great feedback from my patients. They love the website fetures that put us (small independent pharmacy) head to head with large chains. They all ask me how can we afford this professional and easy to navigate site. Thank you very much RefillRx Connect. Keep up the good work!" "We just started working with RefillRx Connect and they have been great! Questions are being answered quickly and their quality of service is excellent. Always a pleasure talking to them on the phone. 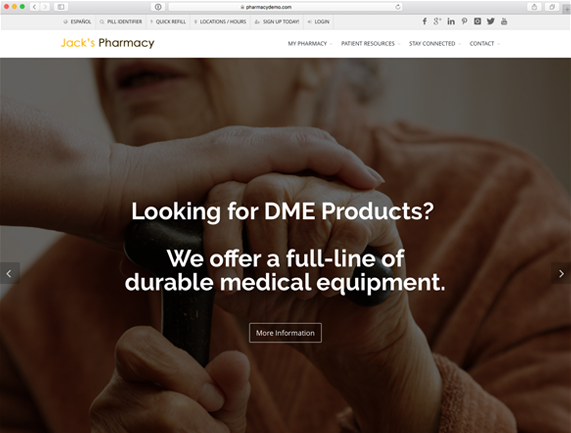 Getting our website started for the pharmacy has never been so easier. I'm glad we are using RefillRx Connect!" I now actually promote our website, as before it was just there and seldom used. "I find myself super busy these days, keeping up with inventory issues, billing, training, marketing, and everything else. This was without a doubt one of the easiest transitions I've come across. Super friendly personnel to walk me through these silly computer issues, great pricing, beautiful webpages, and very timely efforts. I am excited and I like working with people who give the same amount of effort that we give here in our pharmacy! A+." We don't want to be the "jack of all trades, master of none". Your website deserves the best. Where some see a limitation, we see an opportunity to establish partnerships that contribute their core strength, to work for you. Fully integrated, as expected. We are the only officially authorized Rx30 online refill integration partner. Allow your patients the ability to review and refill directly into your Rx30 system seamlessly! If you are unfamiliar with the Rx30 system, check out them out and let them know we sent you! Keeping your website fresh with constantly updated health content is huge! Healthday's partnership brings their widely syndicated articles, videos and wellness library directly to your viewers. Find out more about Healthday and their industry leading health news. Accurate, dependable information is paramount in this industry. Our Wolters Kluwer's Medi-Span partnership brings with it a wealth of medication information, insight and instant credibility for your website's online presence. Find out more about Wolters Kluwer's Medi-Span drug information and pill identification. Patient adherence has never been more important. Vuca Health has created an ingenius way to help. With an industry leading video library, Vuca Health's MedsOnCue service delivers your patient's medication information into a simple, educational video. We have integrated it, where available, into the Medi-Span pill identification feature. Find out more about Vuca Health and their MedsOnCue library. When it comes to servers, we're only interested in the best. Armor is an industry leading provider of secure servers and that is where everything related to your website, resides. Find out more about Armor and the strength of their services. As the only officially authorized Rx30 online refill integration partner, we administer the RefillRx.com website. Although things might look different, you can continue to register, log-in and administer your account here. Simply click the "Get Started" buttons throughout the site to get registered. Do I need a website to use RefillRx.com? The use of RefillRx.com is completely independent of any website you may or may not have. All you need to do is direct your patients there to register and refill. Do I need to be an Rx30 pharmacy to use RefillRx.com? Simply put, yes. RefillRx.com integrates directly with the Rx30 system to allow online access to prescription information. Is there a cost to use RefillRx.com? There is currently no cost to use the RefillRx.com website. What are the pros and cons to using RefillRx.com vs my own website? The ultimate pro is that it's free. The cons are that it is not refilling tailored to your pharmacy. You do not benefit from the ability to establish immediate online brand recognition. Generating traffic through your own dedicated website helps keep your patients informed and engaged. If I decide to build my own website later, do my patients need to re-register? If you use RefillRx.com and decide later to expand your internet presence with a website, your patients do not have to re-register in any way. They simply log into their account on your website. If they continue to use RefillRx.com, it will continue to work, seamlessly. We offer a range of upgrade services to meet your pharmacy needs. Register your pharmacy for the RefillRx.com platform. 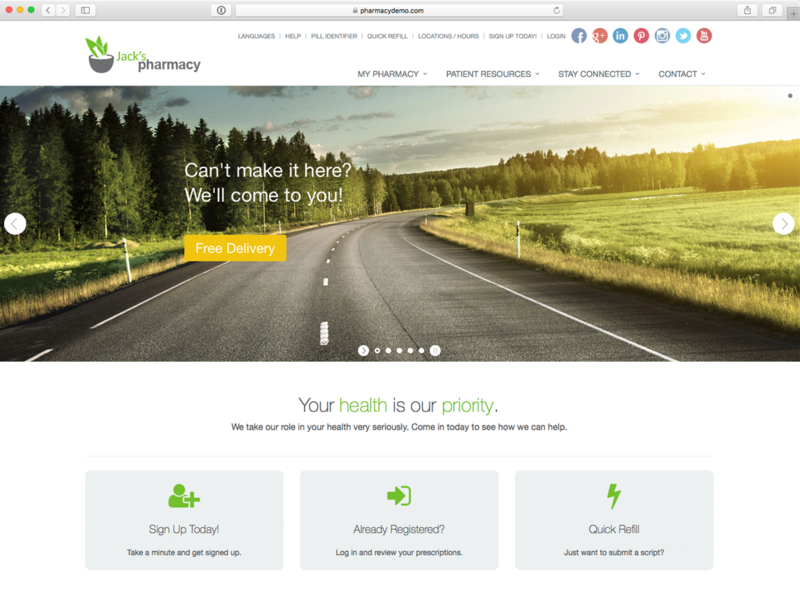 Allow your customers the opportunity to utilize RefillRx.com for online access to their prescriptions with your pharmacy. Includes everything you need to get online quick! Jump start your online presence right with our website package. This turnkey solution will get your pharmacy online in a hurry! Take your website to the next level with dynamic, licensed, health content that updates your site daily and keeps your website fresh! Add the perfect companion to your new dynamic website with a custom branded mobile app available on both Apple and Google devices! Take the first step towards offering an amazing online experience.